Walking through a very crowded Midway Airport the other day, I thought about a key point Simon Sinek makes in his awesome book Start with Why. Sinek mentions that often when traveling, we connect with strangers who turn out to be from our home towns or our home state. These may be people we really don’t know but when we’re away from home we connect with them because we both grew up in the same area. 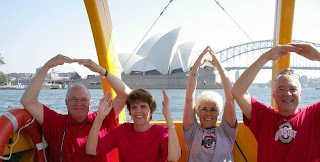 When I wear my Ohio State hat in my travels, I find these types of connections. It almost always starts a conversation with a fellow Buckeye (or sometimes a Michigan fan!). As Sinek says, it gives us that sense of connection. And, that is a connection I feel when traveling through Midway, Sydney Harbor or other airports. A quick nod or greeting (as in "O-H!") to others wearing Ohio State apparel. I wonder if it is still relevant today? Given some of the research listed in Sinek’s book, it seems to ring true. If so, what is your association doing to create a sense of belonging for its members? Shirts? Hats? What other ways to show members they belong?